Australia, thanks and good night. 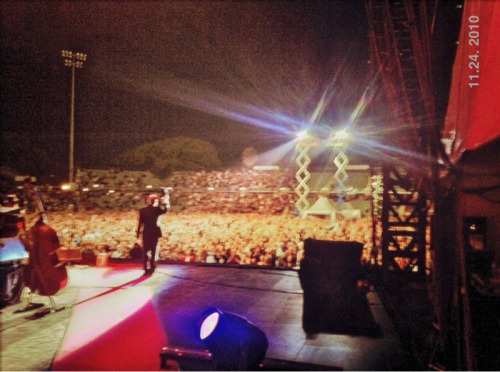 And a big thanks to Joey for great the great pictures today and throughout the entire Australian/New Zealand tour. And Happy Thanksgiving to Leonard and all the Yankees - and whoever celebrates - in the UHTC. And safe travels back to North America! Last edited by sturgess66 on Wed Nov 24, 2010 8:12 pm, edited 2 times in total. JHB_34 Justin Braine - Leonard Cohen is amazing. Thank You for coming to Perth! See you in London soon!! 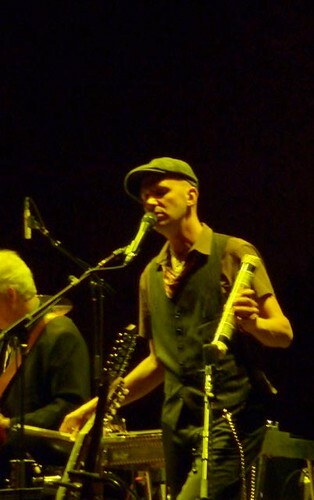 Pikeletmusic Evelyn Morris - I can't believe the leonard cohen tour is over. Such a life changer. Last edited by sturgess66 on Wed Nov 24, 2010 8:09 pm, edited 1 time in total. 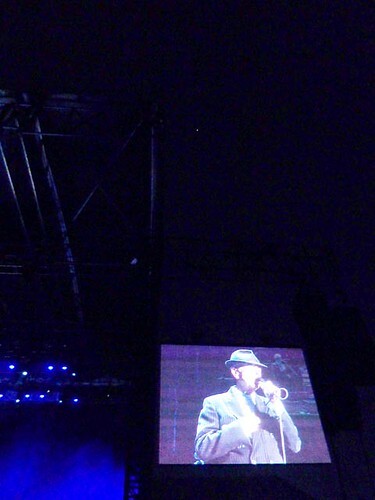 I'm just back from witnessing Leonard's generous and inspiring performance at the nib Stadium in Perth. This performance, which I am sure I will be writing much more about over the coming day or so, was as close to perfection as I think I have witnessed at a Cohen concert ... and I don't say that lightly. It was a combination of factors that made it a great night. Leonard was in rare playful form, everyone in the band was giving their absolute top-notch performance -- including Leonard on guitar, who I thought reached deep down and pulled out something special for this last show. There was a definite sense that this was Leonard's thank you to Australian and New Zealand audiences who have greeted him so warmly throughout the whole tour ... and the Perth audience were the ones privileged enough to enjoy the thank you gift. "A sculptor of silence. Laying it down, bringing it home, putting it to bed, clipping its toenails, smothering it with a pillow, going to jail, joining the Aryan Brotherhood, later converting to Judaism, later losing his faith, spending the remainder of his days working in a half-way house for destroyed vegetarians ... the Regent of Restraint, the Prince of Passionate Precision, Rafael Bernado Gayol!" 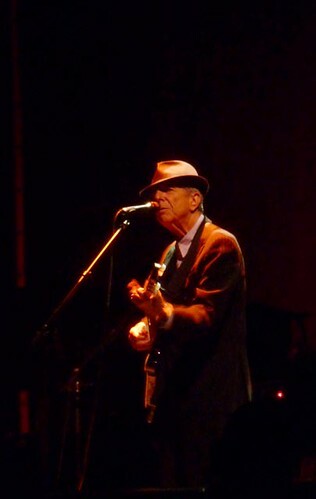 At least in my little world of following Leonard's concert performances (maybe yours too? ), these last two variations of the normal performance are HUGE news! Last edited by dce on Fri Nov 26, 2010 12:33 am, edited 9 times in total. And a big thanks to Joey for the great pictures! Yes, BIG thanks to Joey. 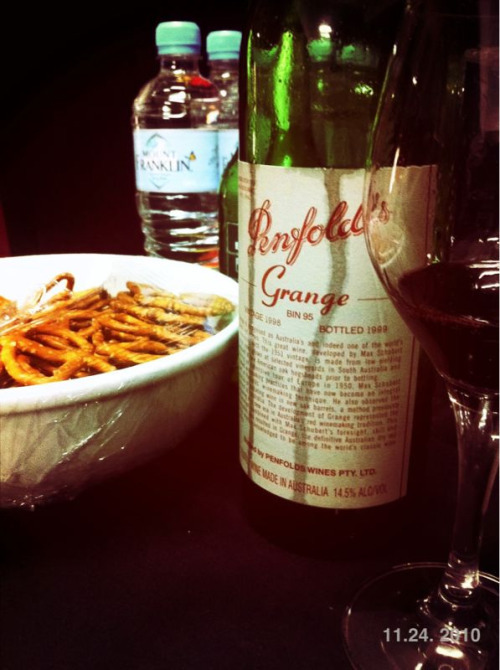 ^^Hope you and the crew are now relaxing and enjoying a few more glasses of our *Grange*. And I'll add - it's been nice traveling downunder *virtually." Last edited by sturgess66 on Wed Nov 24, 2010 8:24 pm, edited 1 time in total. Some video already - hope this bodes as a good sign that there will be more. Uploaded by "khstalker" - Thanks! "The enemy is sleeping, the woman is free - yah"
Uploaded by "offshoreram" - Thanks! Thank you SO much for your concert reports - and for this one in particular. It was wonderful to meet you last night and to share your take on the concert. One final thought. We were disappointed that Sharon was not there but most of all we were concerned that she may be unwell once again. Take care Sharon. What a beautiful & moving concert the Perth concert of 24th November was. Leonard in full voice and the standard of his group was very high as always. Loved it all particularly some of the classics like Hallelujah, Sisters of Mercy, Marianne, etc, etc, etc. It was all very moving. We were overseas when Leonard toured Perth earlier this year and were ecstatic when we found out that he was coming back in November. We are also fans of Sharon Robinson. I know she had a chest infection some time ago. Is that the reason she was not in Perth? Thank you Leonard. We hope you come back to Perth some time. Video uploaded by "bianquita1" - Thanks! The only video I had time to shoot, is this very amateurish clip of THE PARTISAN ... a bit of a teaser, for you see I shot 1,134 photos and I'm flat out, like a lizard drinking editing them. Hopefully, in a few hours, I'll post a Facebook link to an album of the best ones. I htne plan to put them into a video clip with music for everyone's enjoyment. I haven't had time to write a review yet - Ann and I spent time with Forum member Dean (from Adelaide) this morning, I will write one, suffice to say, this Perth concert was in mnay ways quite different to the concert at Sandalford - where the Sandalford concert was best described as spiritual, this concert was fun - you could see (and hear from Leonard's quips), that he was very relaxed and enjoying himself. More later. Also ... for those who think Greg is joking about having taken 1134 photos at the Perth concert ... I can confirm he isn't. I was kindly allowed into the nerve centre where all Greg's image editing is right now in full swing (no doubt), possibly combined with low levels of swearing . I'm wondering BTW if 1134 is some new record for number of photos taken at a single show by one person ...? Big big thanks to Mabeanie and her partner as well for catching up at the concert; it was fantastic to get a bit of a glimpse into how the European and North American fan meets are running these days. Those of us down in Oz have a long way to catch up ... I hope you guys enjoy the rest of your holiday in Aus! AGE does not exist at a Leonard Cohen concert. 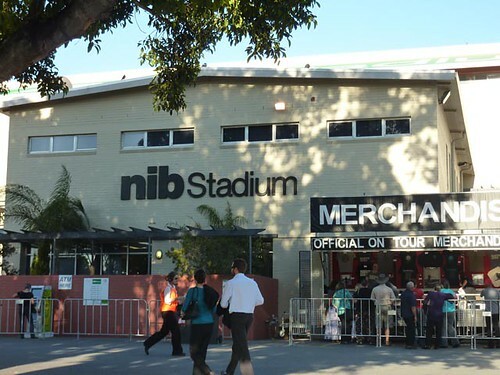 On the last night of his Australian tour, it was incredible to see a mix of baby boomers right through to Generation Y - still kids - streaming into NiB Stadium (Perth Oval) clutching their tickets like their very life depended on it. Cohen’s concerts are frequently referred to as religious or spiritual experiences, and tonight the crowd worshipped at the altar of the 76-year-old music and literary legend. 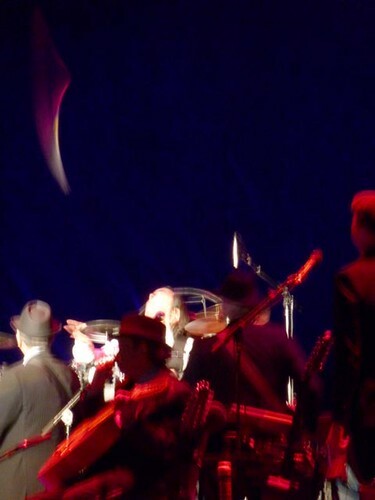 Walking on to stage in a dapper suit, with his now-trademark fedora pulled low, Cohen did not for a minute look like a man 16 years past retirement age. Backed by his eight-piece band, he opened with the one-two punch of To The End Of Love and The Future, revealing the dichotomy that is a Leonard Cohen show. Love and death are constantly intertwined in his lyrics and so it was in his live show, with his rich baritone informing The Future with a sense of unrelenting dread that kept the audience hanging off his every word. The thing about Leonard Cohen that becomes instantly apparent live is that while he is not a singer, he can sing the hell out of a song. He would probably admit that his range is limited and he is certainly no great vocalist in the technical sense, but music is rarely if ever about technical brilliance. More so, it is about soul and personality, elements that come through in phrasing and the way songs are sung. The best example of this on a surprisingly chilly late-spring night was Cohen’s rendition of his classic Hallelujah, which came late in the second set. Made famous by the departed Jeff Buckley, Cohen simply cannot match Buckley’s vocal histrionics, so he does not try. Instead, he simply claims ownership of a song that was always his to begin with, and his more-subdued version of the song wipes the floor with Buckley’s version. 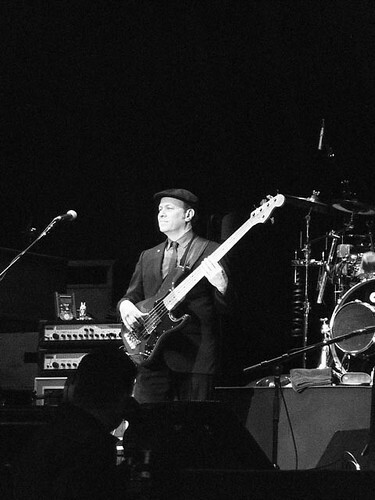 Leaving aside the simple brilliance of Cohen, his backing band must also be applauded for what was a flawless set. 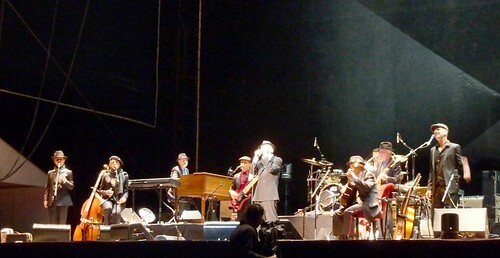 Cohen was certainly ready to applaud them, heaping plaudits on them in each of the four encores. It must also be said that for someone who makes entirely serious music, Cohen has a wicked sense of humour. Whether it was playing I Tried To Leave You for his fourth encore - a song he started with more than a wink and a nod towards the crowd - or his rousing, hilarious introduction of drummer Rafael Gayol, which saw the drummer laying it down, smothering it with a pillow, going to jail, converting to Judaism and spending his remaining days in a halfway house for destroyed vegetarians, he was utterly sincere and utterly hilarious. It’s not often you get to see a genius at work - a genius that is prepared to cast off your preconceived notions of what a genius should be or should do. 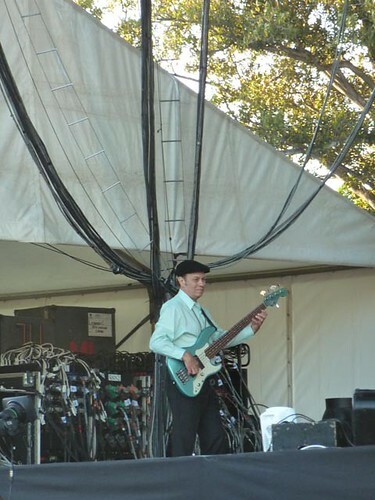 Perth, we are very lucky to have seen this man at work. If there’s one thing left to be said, it is certainly that Leonard Cohen is our man.